For the athlete, see Gustavo Gutiérrez (athlete). For the fencer, see Gustavo Gutiérrez (fencer). Gustavo Gutiérrez Merino, O.P. (born 8 June 1928) is a Peruvian philosopher, theologian, and Dominican priest regarded as one of the founders of liberation theology. He currently holds the John Cardinal O'Hara Professorship of Theology at the University of Notre Dame, and has previously been a professor at the Pontifical Catholic University of Peru and a visiting professor at many major universities in North America and Europe. Gutiérrez is a member of the Peruvian Academy of Language, and a founder of the Bartolomé de las Casas Institute. In 1993 he was awarded the Legion of Honor by the French government for his tireless work. In 2002 Gutiérrez was elected to the American Academy of Arts and Sciences and in 2003 he received the Príncipe de Asturias award. In 2016, he received the Pacem in Terris Award from St. Ambrose University. Gutiérrez was afflicted with osteomyelitis as an adolescent, and was frequently bed-ridden. He had to use a wheelchair from age 12 to 18. He began studying in the faculty of medicine of the National University of San Marcos in Peru in order to become a psychiatrist, then he realized he wanted to become a priest. He completed his theological studies in the Theology Faculty of Leuven in Belgium and in Lyon in France, where he studied under Henri de Lubac, Yves Congar, Marie Dominique Chenu, Christian Ducoq, and several others. It was also here where Gutiérrez was introduced to the Dominican and Jesuit ideologies, and was influenced by the work of Edward Schillebeeckx, Karl Rahner, Hans Küng, and Johann Baptist Metz. His time in Europe influenced Gutiérrez to discuss the openness of the Church to the contemporary world. He was also influenced by Protestant theologians such as Karl Barth and social scientists such as François Perroux and his idea of development. 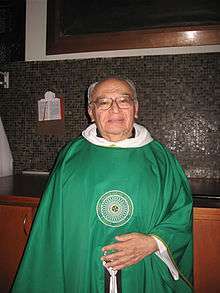 In 1959, Gutiérrez was ordained a priest. When he returned to Peru, Gutiérrez began to formulate his understanding of Latin American "reality"– the foundation and driving force of liberation theology. He states: "I come from a continent in which more than 60% of the population lives in a state of poverty, and 82% of those find themselves in extreme poverty." Gutiérrez focused his efforts on the rediscovery of love thy neighbor as the central axiom of Christian life. An outline of Gutiérrez's theological proposal was drafted in his conference "Towards a Theology of Liberation" during the Second Meeting of Priests and Laity in Chimbote, Peru, between July 21 and 25, 1968. In this proposal, he cites on multiple occasions the Gaudium et Spes and the Populorum Progressio. To Gutiérrez, the source of the problems of Latin America was the sin manifested in an unjust social structure. His solution to this solution was to emphasize the dignity of the poor by prioritizing the glory of God present in them. This perspective would be refined over the next five years, until Gutiérrez published A Theology of Liberation in 1973. Liberation theology thus emerged as a biblical analysis of poverty. Gutiérrez distinguished two forms of poverty: a "scandalous state" and a "spiritual childhood." He noted that, while the former is abhorred by God, the second is valued. Gutiérrez identified that each form of poverty was present in Latin America, wherein one hungers for bread and for God. It is only through the manifestation of a committed faith that the purposes of God can be manifested to man, regardless of the color or social class under which he was born. Liberation theology insists on prioritizing the gift of life as the supreme manifestation of God. Gutiérrez calls for understanding the reality of the poor. Being poor is not simply lacking the economic resources for development. On the contrary, Gutiérrez understands poverty as "a way of living, of thinking, of loving, of praying, of believing and waiting, of spending free time, of fighting for life." That is why he says: "Poverty is not a fatality, it is a condition." On the other hand, the Dominican emphasizes that poverty is the result of society. However, for many other theologians it seems that reducing the problem of poverty to something totally social is quite simple. To Gutiérrez, the origin of poverty is much more complex. In Latin America, it originates from the times of the conquest and to that is added several political, geographical, and personal factors. The announcement and testimony of the reign of God denounces poverty. The intelligence of faith reveals essential aspects of God and provides a perspective for theological work. Walking in the footsteps of Jesus, otherwise known as spirituality, is, on the deepest level, which everything else rests. The main biblical foundation for this praxis lies in the kenotic incarnation of Christ. To Gutiérrez, the ministry of Christ among the rejected and despised of his time is a clear example for the contemporary Church. Furthermore, "the incarnation is an act of love. Christ becomes man, dies and rises to liberate us and make us enjoy freedom. To die and be resurrected with Christ is to overcome death and enter into a new life. The cross and the resurrection seal our freedom." The freedom of Christ is seen by Gutiérrez as the giver of spiritual and economic freedom. Theological reflection on liberation is not just a simple discourse without practical and concrete implications. Reflection on the situation of the poor leads to what liberation theologians call "liberating praxis," where they attempt to rectify the process by which the faith of the Church builds the economic, spiritual and intellectual liberation of socially oppressed peoples as fulfillment of the kingdom of God. The liberating praxis, then, has its basis in the love that God manifests for men and in the sense of solidarity and fellowship that should exist in interpersonal relationships among the children of God. Liberation theology originated as a call to all believers in Latin America to resume the biblical commitment to the poor. Gutiérrez's continuous message on the reality of this world serves as a rebuke to those who have forgotten this sphere of Christian love. Gutiérrez's thought has marked, consciously or unconsciously, all of Latin American theology. This influence can be observed from the evangelical proposal of the "integral mission" developed years after the origin of liberation, to the development of social ministries within the evangelical churches in the last decades. Among his most prominent followers are Hugo Echegaray and Luis Felipe Zegarra. His friends include the German theologian Gerhard Ludwig Müller, the head of the Congregation for the Doctrine of the Faith. On the subject of Gustavo Gutiérrez's thought, of which he was a student, Müller stated: "The theology of Gustavo Gutiérrez, how it is considered, is orthodox because it is orthocratic and teaches us the correct Christian way of acting, since it derives from authentic faith." While Gutierrez's positions were never censored by the Church, he has been asked to modify some of his propositions. Las Casas: In Search of the Poor of Jesus Christ, trans. Robert R. Barr (Maryknoll: Orbis, 1993). Originally published as En busca de los pobres de Jesucristo: El pensamiento de Bartolomé de las Casas (Lima: CEP, 1992). The God of Life, trans. Matthew J. O'Connell (Maryknoll: Orbis, 1991). Originally published as El Dios de la vida (Lima: CEP, 1989). On Job: God-Talk and the Suffering of the Innocent, trans. Matthew J. O'Connell (Maryknoll: Orbis, 1987). Originally published as Hablar de Dios desde el sufrimiento del inocente (Lima: CEP, 1986). The Truth Shall Make You Free: Confrontations, trans. Matthew J. O'Connell (Maryknoll: Orbis, 1990). Originally published as La verdad los hará libres: Confrontaciones (Lima: CEP, 1986). We Drink from Our Own Wells: The Spiritual Journey of a People, 20th anniversary ed., trans. Matthew J. O'Connell (Maryknoll: Orbis, 2003; 1st ed., Maryknoll: Orbis, 1984). Originally published as Beber en su propio pozo: En el itinerario espiritual de un pueblo (Lima: CEP, 1983). A Theology of Liberation: History, Politics, and Salvation, 15th anniversary ed., trans. Caridad Inda and John Eagleson (Maryknoll: Orbis, 1988; 1st ed., Maryknoll: Orbis, 1973). Originally published as Teología de la liberación: Perspectivas (Lima: CEP, 1971). ↑ Cornell, George W. (August 6, 1988). "Founder of liberation theology deals with acclaim and criticism". Lawrence Journal-World. Retrieved 1 September 2010. ↑ "Gustavo Gutierrez, O.P.". Department of Theology: People. University of Notre Dame. Retrieved 1 September 2010. ↑ "Pacem in Terris Past Recipients". Catholic Diocese of Davenport. Retrieved 4 November 2016. ↑ Hartnett, Daniel (February 3, 2003). "Remembering the Poor: An Interview with Gustavo Gutiérrez". America Magazine. Retrieved 1 September 2010. ↑ "Gustavo Gutierrez biography (spanish)". Gustavo Gutiérrez (1928). Steven Casadont. Retrieved 11 October 2010. ↑ Botella Cubells, Vicente (8 de noviembre de 2011)). «Gustavo Gutiérrez, padre de la Teología de la Liberación». Facultad de Teología. Valencia. ↑ Gutiérrez, Gustavo (2001) "Quehacer teológico y experiencia eclesial"; J.J.Tamayo y J.Bosch, eds., Panorama de la Teología Latinoamericana, Estella. ↑ Gutierrez, Gustavo (1991). "Juan de la Cruz desde America Latina". Retrieved March 9, 2015. ↑ Gutiérrez, Gustavo (1968) "Hacia una teología de la liberación. Consultado el 23 de julio de 2014. ↑ Volver arriba ↑ Santiago 2:6. Christian Smith (2002). "Las Casas as Theological Counteroffensive: An Interpretation of Gustavo Gutiérrez's Las Casas: In Search of the Poor of Jesus Christ". Journal for the Scientific Study of Religion. 41: 69–73. doi:10.1111/1468-5906.00100. Alexander Nava (2001). The Mystical and Prophetic Thought of Simone Weil and Gustavo Gutiérrez: Reflections on the Mystery and Hiddenness of God. SUNY Press. ISBN 0-7914-5177-1. Robert McAffee Brown (1980). Gustavo Gutierrez: Makers of Contemporary Theology. John Knox. ISBN 0-8042-0651-1. Gustavo Gutiérrez on the University of Notre Dame website. Audio downloads of Gutiérrez's 1995 Drummond Lectures in Scotland. Sacred Congregation for the Doctrine of the Faith-August 6, 1984. Instruction on certain aspect of "Liberation Theology". Liberation Theology in the World History Encyclopedia.